Modern swimming pool design does not always mean that a pool was built recently or has all of the most high-tech features and materials. Modern pool design dates back to California in the 1930s, when wealthy movie stars were able to afford houses with landscaping that blended the indoor/outdoor lifestyle. These early residential pools often reflected the home's architecture, complementing its design rather than competing or looking like a stand-alone feature. Before the introduction of gunite—a mixture of concrete and sand—most residential swimming pools were built from plywood or fiberglass that held poured concrete or by constructing a shell of reinforced concrete blocks. This costly construction process made private pools attainable primarily to the upper class. It also made shapes other than traditional rectangles easier to execute. 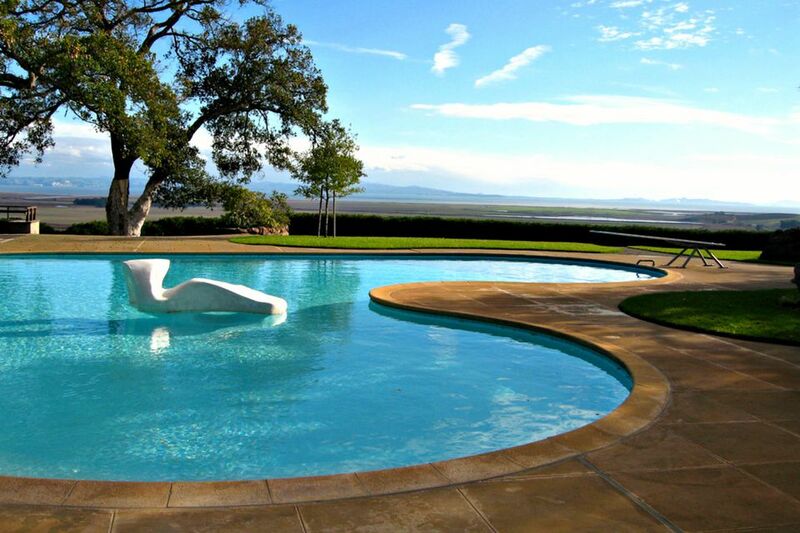 During the post-World War II housing boom, gunite swimming pools became more of an achievable part of the outdoor living lifestyle--probably nowhere more so than in sunny California. Groundbreaking features of the Donnell pool include a small "island" in the pool with a sculpture by Adaline Kent, a floating deck, and, of course, its Midcentury modern biomorphic shape. Architectural Pools: These complement the architectural style of the house and often have more formal lines or geometric shapes. Naturalistic: Inspired by nature and its surroundings, this type of pool has more freeform shapes with faux rock formations, waterfalls or features, gradual beach-like entries, and themed landscaping (tropical, desert, etc.). It's not evident, but this pool was built off the second floor of the house, about 21 feet above ground level. This required the builder to pour and construct retaining walls on both sides of the yard and pool. While its shape is a traditional rectangle, this pool was modernized with a negative edge, tiled logo at the bottom, and a glass-chip fireplace. 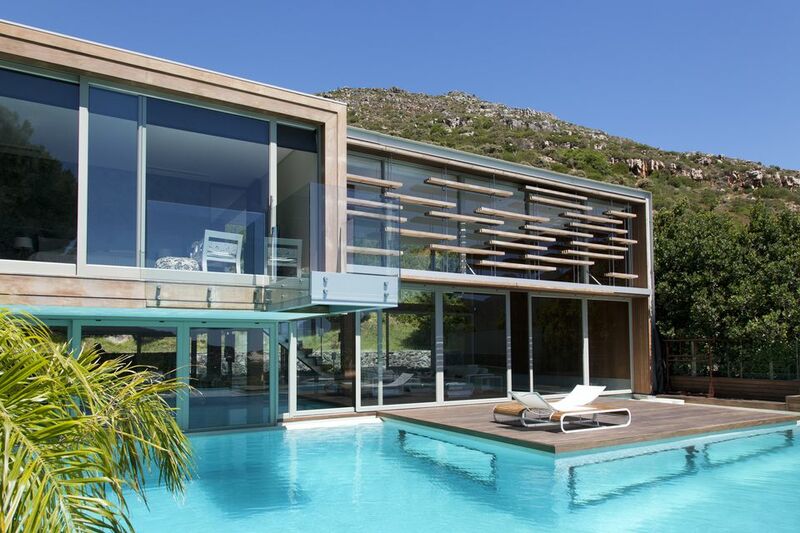 An eco design, the pool is solar heated and its filtration system and pumps are hidden below water level. Built in a small town near a fishing harbor, this saltwater pool features a raised square platform with a four-sided vanishing edge. The focal point, of course, is the sphere, which was ​designed by the builder's own artificial rock department. LED lights enhance the reflection of the sphere into the pool. Also designed on a small lot, this space was designed to accommodate the client's request for a large swimming pool. Adding to the challenge: the house and pool house were already in place when the pool project began. The client also requested waterfalls that be positioned away from the house to escape the sound. The builder created a long, freeform pool with two waterfalls and a hot tub situated between the main house and pool house, tying together everyting. Perched atop a mountain with a spectacular view of the city lights below, this enclosed pool was designed to capture the beauty of its surroundings, both near and far. The pool's vanishing edge is angled, and the glass structure echoes this shape. The three separate pools include an exercise pool with swim jets and a children's pool—all heated by solar energy. The clients for this modern design wanted a home and yard with a strong focus on sustainability and innovation. Nature is mimicked with a mixture of aquatic plants, reeds, and lotus. A waterfall splashes through a large natural boulder, while local river rock and different shades of PebbleCrete were used for the pool surfaces. Continuing with the natural theme, the pool's entry steps were made from hand-cut stone, then accented with blue LED lights. Layers of filtration media help to create an organic filtration system that makes the pool clean for swimming and a safe habitat for certain types of fish, dragonflies, tree frogs, and other wildlife. This hillside home near a lake features a pool and spa area with several custom features. A negative-edge pool and spa are joined by a "creek" made of river rock pebble tile, travertine, glass pebble tile, and travertine. The creek flows into the pool, which wraps around a seating area with a fire pit, spilling into a catch basin below. Water from the spa appears to carve another creek. The Santa Monica, California, home and yard of interior designer Kathryn Ireland (not to be confused with Kathy Ireland, the former model and lifestyle brand entrepreneur) reflects her penchant for using vivid colors and textures in her designs. Ireland's pool area is personalized with ceramic tile, a coordinated bench, and pretty, casual cushions and pillows. Situated on a lot that used to be a 15-acre farm, the challenge of this design was to deconstruct the old pool and locate a new one on a much smaller part of the property, adjacent to the house--and make them both look like they were built at the same time. Stone columns support a pergola that connects the house to the patio and pool area, while a swim-up bench that runs the length of the pool offers in-pool seating. A fire bowl serves as a focal point, and a nearby fire pit provides yet more seating for larger get-togethers. Another yard with limited space presented a challenge for the designer of this pool group. Viewable from several rooms of a two-story house, the project includes a vanishing edge pool, spa, and children's wading pool. Colors were chosen to look like a natural pond.